Tim's appear to have gone for the 'all things for everyone' approach to packaging design. They have maintained their traditional red and white stripes, they have also included their similarly traditional mountain graphic. The effect seems to mix modern with classic along with mundane fonts not very well. The Reduced Fat range manages to lack further character and originality when compared to the Cascade range of bag designs. Despite not being part of the 'Cascade Style' range, these Chips were just as crisp and crunchy as any of Tim's excellently crunchy Chips. They took some pressure to smash and even then they cracked and struggled against the pressure. 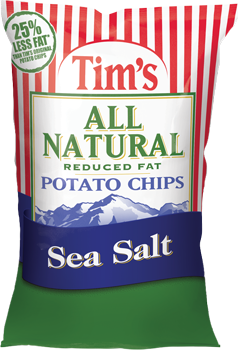 For a plain, relatively seasoning-less Chip, that features the 'All Natural' tag; so popular with Potato Chips manufacturers today, these had a bundle of character. The Chips were good and strong. There was an even smattering of different sized oil bubbles, and the coloring was a sort of off-golden yellow, without any browning or 'dirty' looking Chips. A Nose Plunge Test revealed an empty bag! We had to double check to make sure there were Chips in there, such was the lack of aroma. The taste was similar. We knew we were eating Chips, there was something crunching away in our mouths. But there was no flavor to speak of. Sure, they were a little salty potato, but mostly they tasted of a Chip begging for an exciting sandwich to go with them.